Prospective REU students should review the scientific objectives for each of the projects described below and identify projects that pique their curiosity or align with their career or educational objectives. On our application, students are required to list three faculty mentors with whom they would like to work. Projects should be checked for any prerequisites and/or the amount of computational work involved. Not all projects are appropriate for students at all stages of education. Background paper 1 [PDF] My lab works at the interface of mathematics and biology, studying using mathematical and statistical models, disease of public health importance such as malaria, Ebola, and Zika. Background paper 2 [PDF]. My lab also studies plant diseases of great agricultural and economic importance and their ecology using mathematical models. An REU student in my lab this summer will have the opportunity to study and explore soil-plant feedback, demographic exploration of prairie plants, and community ecology. The drivers of biodiversity of the prairie are not well understood and there is an opportunity to investigate the impact of phylogenetic diversity, precipitation level, or microbial soil community structure on the life history of endemic prairie plant species. This project comes with an opportunity for the student to collect plant data at the KU Field Station, process the biological samples collected, and statistically analyze the data using R to elucidate the underlying relationships that drive the plant community ecology. (The 2nd background paper goes with this description) There is also an opportunity for an REU student to study the human epidemics such as the opioid epidemic which is a growing national crisis. In this project, the student will develop epidemic models connecting opioid misuse epidemic and viral infections such as hepatitis C among injection drug users (IDUs). These models will be used to develop strategies for disease management, (The 1st background paper goes w​ith this description). Background paper [PDF] Our lab investigates the ecological and evolutionary consequences of plant-microbe interactions. Much of our work focuses soil fungi (called mycorrhizal fungi) that commonly improve plant growth through increased access to soil resources. We are particularly interested in how the benefits that plants receive from these fungi change over time and the potential role of these fungi in maintenance of plant species diversity. We often work in native prairie, where we have found that these fungi play primary roles in plant dynamics and in the restoration of native diversity. Work on this problem could involve work in the field, greenhouse, lab (at microscope work or DNA analysis) or computer (modeling). Background paper [PDF] Our lab investigates how climate change and landscape-level land use change influence flows of carbon and nutrient through terrestrial ecosystems. We are especially interested in how rooting depth changes with land use change, and how that interacts with climate to govern soil nutrient transformations. This is important, because soil microbes and roots both generate CO2, providing an important feedback to Earth’s climate. It’s also important because those belowground activities result in changing availabilities of soil nutrients, thus influencing ecosystem productivity. Work in the lab can revolve around some combination of field, greenhouse, and lab work, working across the precipitation gradient in the Midwest to explore how precipitation availability influences deep soil biogeochemistry. Background paper [PDF] The germline is an immortal lineage that must maintain a stable genome across generations. However, selfish DNA, such as transposable elements (TEs), pose a threat to genome stability. This is because TEs can cause harmful mutations and chromosomal rearrangement. In response to this, diverse systems have evolved to maintain genome stability. One system is based on small, epigenetically inherited RNAs known as piRNAs. Another system - the DNA damage response - must make a "decision" as to whether DNA damage should be repaired or whether stem cells with too much damage must undergo programmed cell death. The Blumenstiel lab is interested in how these systems of genome stability co-evolve with TEs. A variety of projects are available for a summer student. These include: an evolutionary analysis of genome stability genes, RNA-seq analysis to probe the evolution of the DNA damage response or genomic analysis to determine how piRNAs silence genes by mistake. Students must have taken genetics. Background paper [PDF] My lab investigates the formation and maintenance of tiny single-celled tubes such as capillaries through use of the single-celled excretory cell of the nematode C. elegans as a genetic model. This cell is the largest single cell in nematodes, and maintains proper water content of the organism during sudden changes in the environment. Cell shape here depends on a constant interchange of cell cytoskeleton with vesicles moving to areas of growth, and the excretory cell genes we have previously identified include many human homologues. A recent project undertaken in part by an undergraduate student has recently identified several unexpected genes (with human homologues) that are also needed to maintain morphology of this cell during growth. Projects for this summer will involve using CRISPR to attach fluorescent proteins to these genes, followed by microscopy to identify the subcellular location and movement of the novel proteins during cell growth. This work will deepen our understanding of the complicated interplay between cell cytoskeleton, control of ion content, and vesicle movement in determining the shape and growth of cells. Background paper [PDF] Many bacteria communicate with dedicated chemical or peptide signaling molecules. Such communication systems are widespread and found in bacteria, animals, plants and even insects. Our lab is particularly interested in a type of communication in bacteria that is cell density dependent called quorum sensing. Quorum sensing systems are thought to be important for cooperative or group activities, and may be important for bacteria during competition with other strains or species of bacteria. Our laboratory is developing model systems to study quorum sensing, cooperation and interspecies competition in bacteria. The REU student will participate in projects designed to test the hypothesis that quorum sensing is important for bacteria to survive in multispecies communities and the student will investigate the molecular mechanisms related to quorum sensing. Background paper [PDF] The goal of this research is to understand the assembly of bacterial nanoinjectors. Many bacterial pathogens assemble a protein nanoinjector of the type III secretion system (T3SS), to deliver virulence proteins directly into host cells to initiate infections. Bacterial nanoinjectors are assembled from over 20 different proteins and part of the nanoinjector consists of an external needle and a tip complex. Our goal is to determine the protein-protein interactions involved in the assembly of the needle and the tip complex. The methods used are nuclear magnetic resonance (NMR) spectroscopy, crystallography and computational approaches, followed by mutagenesis and cell-based assays. We also seek to find small molecules that could disrupt the assembly of bacterial nanoinjectors, to develop the next class of anti-infectives. Background paper [PDF] The majority of sequenced bacterial genomes encode one or more (up to ~70) proteins belonging to the AraC family of transcriptional activators. These proteins are required to activate expression of genes involved in carbon metabolism, stress responses and virulence – but in most cases, only when the cell is in the appropriate environment. The environmental signals that switch AraC family activators between off and on states are most often small molecule effectors that bind to one protein domain and allosterically regulate the activity of the other domain. The goal of one REU project will be to identify mechanisms involved in the allosteric signaling in AraC family proteins. This will involve genetic and biochemical approaches, such as the construction of mutant proteins, protein purification and assay of protein-DNA interactions. The student will have the opportunity to interact with the P.I., graduate students and undergraduate students in the laboratory, and will participate in weekly lab meetings. Background paper [PDF] How and why do new species form? Members of the Glor Lab investigate these questions with lizards by combining field studies of animals in nature with experimental studies of animals in a captive colony. Potential REU projects include a diverse range of questions about phylogenetics, speciation, and the genetic basis of species differentiation. Previous undergraduate researchers in the Glor Lab have used phylogenetic and population genetic analyses to delimit species boundaries with genomic data, investigated the role of behavioral divergence in reproductive isolation, and characterized the heritability of phenotypic traits like dewlap color and pattern. Please visit KU Herpetology's research page to learn more about research conducted by the Glor Lab and others. Background paper [PDF] Flower color, shape and nectar reward can evolve when new and beneficial flower-pollinator interactions arise. In the Hileman lab (www.hilemanlab.org), we investigate the genetics of flower evolution. One of our study systems is Penstemon, the largest endemic flowering plant genus in North America. The majority of Pentemon species produce flowers that are adapted to bee pollination, but within this genus adaptation to hummingbird pollination has evolved approximately twenty separate times! This natural repeated experiment in floral evolution provides us with an amazing opportunity to investigate the genetic changes that are required for hummingbird-adapted flowers to evolve from bee-adapted flowers. Potential REU projects include investigations into the genetics of flower color, flower shape and floral nectary evolution. Projects will be tailored to REU student’s specific coursework background, lab skills (if any), and interests in flower evolution and/or developmental genetics. Background paper [PDF] The major focus of research in the Jensen laboratory has been the global study of metazoan parasite biodiversity. While parasitologists have estimated that parasites comprise over half of all animal species, many regions and ecosystems remain understudied for parasites; this is especially true for the marine environment. Current research focusses on the documentation of macroevolutionary patterns in fish parasites. Patterns of primary interest are those relating to a group’s evolutionary history, host associations, biodiversity, and geographic distribution, as well as the potential cophylogenetic patterns that exist between parasites and their hosts. REU students will become familiar a specific host-parasite system (i.e., tapeworms and their shark and ray hosts), and acquire the necessary skills to distinguish among tapeworms of different orders and prepare the tapeworms as whole mounts for study with light microscopy and scanning electron microscopy. A specific research project centered on description of tapeworm novelty using primarily morphological data will be chosen depending on the interests of the student. Background paper [PDF] Bacteria require metal ions for survival and have developed elaborate scavenging mechanisms. Our goal is to understand the enzymes that produce small molecules called siderophores – one iron-scavenging mechanism of these bacteria. A student completing an REU project may develop an overexpression in E. coli, purify the enzyme, and work to develop a crystallization protocol for the enzyme. The student may also establish an assay to detect enzymatic activity and conduct steady-state analyses of the enzyme. 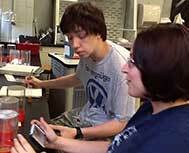 The student will learn protein purification, enzyme analysis and structure determination. An understanding of introductory biochemistry will be an asset. Background paper [PDF] Tissue homeostasis is maintained by a series of signaling pathways that control cell proliferation, differentiation and death. Loss of tissue homeostasis is an early step in the development of most cancers. Although Adenomatous polyposis coli protein (APC) plays a particularly critical role in maintaining cellular homeostasis of intestinal epithelium, specific functions of nuclear APC are only beginning to be understood. To analyze nuclear functions of APC in intestinal tissue, our lab has generated a mouse model in which the Apc nuclear localization signals (NLS) have been mutated leading to reduced levels of nuclear Apc. The REU student will analyze mouse phenotypes relating to intestinal cell differentiation, apoptosis, stem cell maintenance, and asymmetric cell division using histological and molecular biology techniques. The student will learn basic mouse genotyping, RNA and genomic DNA isolation, RT-PCR, tissue preservation, sectioning and protein staining techniques, as well as cell lysis and quantitative protein analysis. Background paper [PDF] Research in my lab explores the diversity and interactions of soil microbes with a focus on fungi. These interactions include work on individual microbes, communities of microbes and plants, and even microbial functions to whole ecosystems. Our ongoing lab projects include the study of disturbance with an emphasis on fire, integrating microbes into ecological restoration, and using soil microbes to transform agriculture. REU students will develop an independent project while getting hands-on experience with fungal culturing, molecular techniques to characterize microbial communities, and field work. Recent undergraduate projects have explored how management decisions and land use history alter soil communities surrounding National Parks, whether fire severity determines ectomycorrhizal fungal colonization of seedling pines, and if small mammal burrowing impacts restoration by altering soil microbes and the availability of nitrogen. Background paper [PDF] Cells harbor molecular machineries that guard against the invasion and expression of foreign genes. Such foreign genes might include viruses, transposons, or even DNA that is introduced in the laboratory environment. RNA interference (RNAi) and related cellular mechanisms can utilize the sequence information in RNA molecules to respond to invading nucleic acids, leading to silencing of their expression. We utilize Caenorhabditis elegans as a vehicle for the discovery of conserved mechanisms that contribute to anti-foreign genome responses, using genetics and sequencing techniques to reveal mechanistic components. Background paper [PDF] All organisms get sick, but some get sicker than others. We try to understand the genetic basis of those differences both within and between species. Projects in the lab involve experimental infection with different microbes to determine how different genotypes (within or between species of Drosophila) respond. Then we will use a variety of genetic, genomic and transcriptomic (RNA-seq) techniques to better understand the genetic basis of those differences. Once identified, we will use CRISPR-Cas9 edited organisms to validate our findings. These studies will help us understand how immune defense, and the genes involved in immune defense, evolve within and between species. Background paper [PDF] During post-embryonic development in animals, organs and tissues grow at different rates relative to each other, which suggest that there must be tissue-specific growth mechanisms to control their differential post-embryonic growth trajectories, although surprisingly we know little about them. We are using the larval trachea of Drosophila melanogaster as an emerging model of tissue-specific growth. Not only is the larval trachea a well-studied tubular organ that allometrically expands in size and complexity in response to the increasing oxygen demands of a developing animal, it also can be easily visualized and measured in living animals. We have identified mutations in eight genes that show altered growth specifically in the larval trachea. Importantly, these genes include both positive regulators of tracheal growth. In one REU project, the student will conduct genetic interaction and epistasis experiments to determine which of these genes function together and how they are ordered in that pathway. In a second REU project, the student will use genetic mosaic analyses to determine whether these genes effect tracheal growth in a cell autonomous or non-autonomous fashion. Background paper [PDF] Cancer stem cells (CSCs) are a subpopulation of cancer cells capable of self-renewal and differentiation, and have been identified in a variety of tumors. CSCs are resistant to current cancer therapy and are responsible for tumor recurrence and metastasis. To be maximally effective, cancer therapy must be directed against both the resting CSCs and the proliferating cancer cells. Our goal is to employ a contemporary, structure-based, multidisciplinary and integrated drug discovery approach to discover and design novel drugs that inhibit the CSCs via blocking the cell signaling pathways involved in CSC function. We have recently identified several promising lead compounds to be further developed as novel chemical probes and eventually an entire new class of molecularly targeted anti-cancer drugs. With supervision of the PI and direction from post-docs in the lab, the REU student will examine the activity of the lead compounds, validate the target, and delineate the mechanism of action in CSCs. 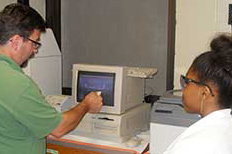 The student will learn basic molecular biology and cell biology assays, as well as new techniques for CSC analysis.